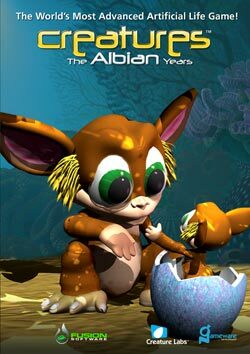 Creatures: The Albian Years is a recompilation of the original Creatures and Creatures 2. Note that, unlike Creatures Village, the two included games are entirely separate in every way other than the CD name. It is however possible to import C1 creatures into C2 using the Nornverter, but it isn't included with the game and needs to be downloaded seperately from AmberCreatures. 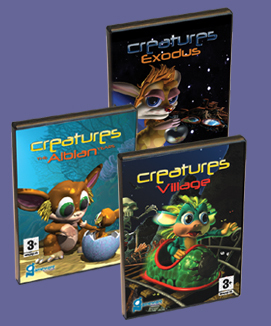 You may also need the Creatures Remastered Patch to make this game work with addon packs designed for previous games. Using the Hatchery may make the game lag. Creatures 2 genetics kit can't find the Norn's DNA data. 1. Go to my documents and open the creature 2 file. 2. Go into the Genetics folder and copy whichever Norn's DNA you want to view (it should have a serial number which matches the number on the error message you receive). 3. Go into programme files on whichever drive you installed the game. 4. Open the creatures 2 file. 5. Open the genetics folder and place the copied file in here. 4. Reload creatures 2. You should now be able to view the DNA of whichever Gene files you copied over. 2. Now you should still have a Creatures 1 and 2 file left in your "my documents" under a general name "creatures". 4. Now reinstall Albian Years. 6. Now when you load the game it will load which ever folder in the my documents section says "Creatures 1" on it. So to get a new world you just need to copy the blank C1-alternative and then rename this copy of the folder "Creatures 1" and change the name of the original Creatures 1 folder. Basically you keep a blank world to copy from. Then you name whichever copy you want to play "Creatures 1" and rename the world you were playing i.e. the one that used to be called "Creatures 1". This page was last modified on 26 April 2018, at 18:49.